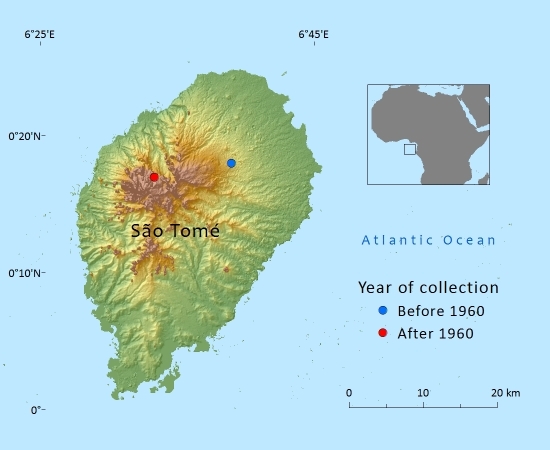 Endemic to the west central African country of São Tomé and Príncipe where it occurs on a single mountain on São Tomé. Here it is threatened by deforestation. West Central Africa (Gulf of Guinea Islands): São Tomé. The population is naturally small as it is confined to a single mountain. At lower altitudes larger trees have been felled and presumably the number of mature trees has therefore decreased. Afrocarpus mannii is endemic to the volcano Pico de São Tomé from altitudes of ca. 1450m up to the summit area at 2142m. Nowhere is it a tall tree and at the summit it is reduced to dwarfed krummholz. It is common in the high montane cloud forest where this has remained undisturbed, which appears to be the largely case at least above ca. 1500m. The timber of A. mannii is valuable in trees of good size and shape, which have become scarce. It is used for light construction. This species has been planted in rural areas in Cameroon and Ivory Coast and probably elsewhere in W Africa as a canopy tree or windbreak for coffee plantations and as an amenity tree in villages. The current population of this species is confined to the Pico de Sao Tomé from above 1450 metres above sea-level to the summit. This area is less than 25km² within which the area of occupancy (AOO) of Afrocarpus mannii must be substantially smaller than this. It is certainly smaller than the threshold for Vulnerable under D2. As the only known population, it is vulnerable to stochastic events such as volcanic eruptions, fires or severe storms. Deforestation at lower to middle altitudes on the mountain has been the main threat to this species, which is endemic to the island. The population lies entirely within the Obo National Park. At higher altitudes above 1500m there still appears to be a good forest cover, so that under adequate protection trees of this species could grow to size replacing trees logged in the past. de Laubenfels, D.J. (1969). A revision of the Malesian and Pacific rainforest conifers, I. Podocarpaceae, in part. Journal of the Arnold Arboretum 50:274-314. Hutchinson, J., Dalziel, J.M. & Hepper, F.N. (1927). Flora of West Tropical Africa. Published by the English Ministry of State for the Colonies. A.Farjon, 2016. Afrocarpus mannii, from the website, Threatened Conifers of The World (http://threatenedconifers.rbge.org.uk/taxa/details/852).